Submissions are no longer being accepted. Visit our Facebook page to vote for your favorites! We chose over 100 finalists this year and we need your help to pick the Facebook Favorite! Vote by liking, sharing, or commenting on your favorites. Winners will be announced on Monday, April 24! 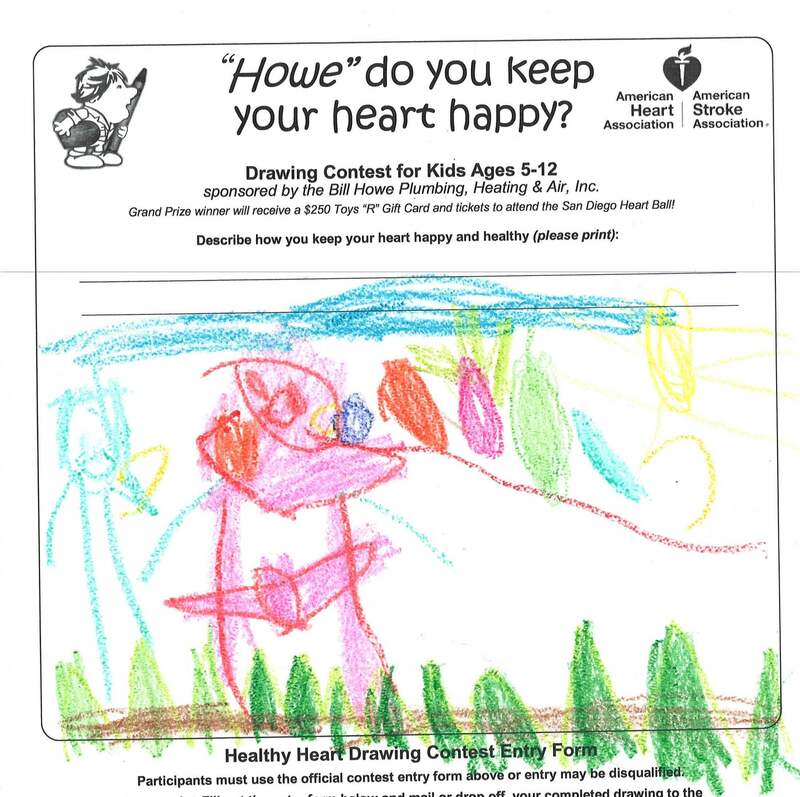 Bill Howe Plumbing, Heating & Air Conditioning and the American Heart Association proudly present the 6th Annual “Howe” Healthy Is Your Heart Drawing Contest! 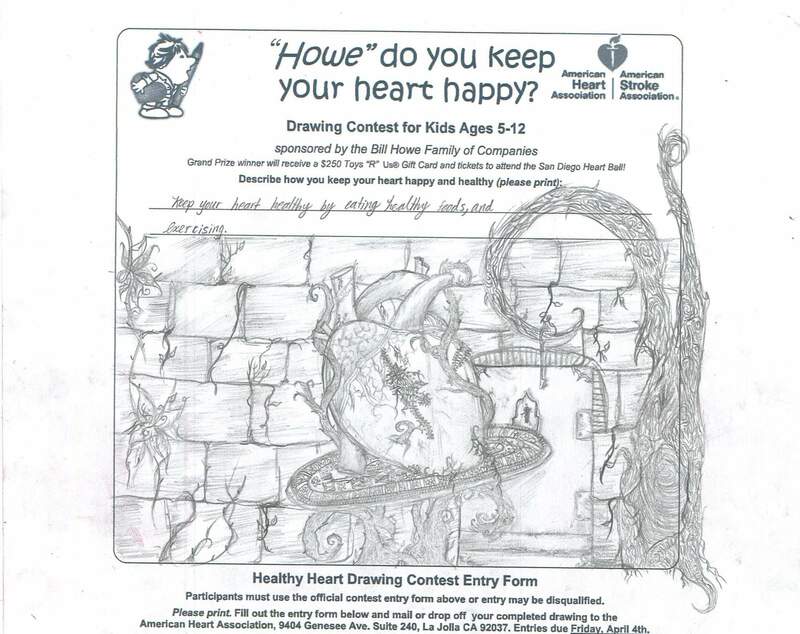 Although the Bill Howe Family of Companies has been a long-time supporter of the American Heart Association, our contest is entering into its 6th year! 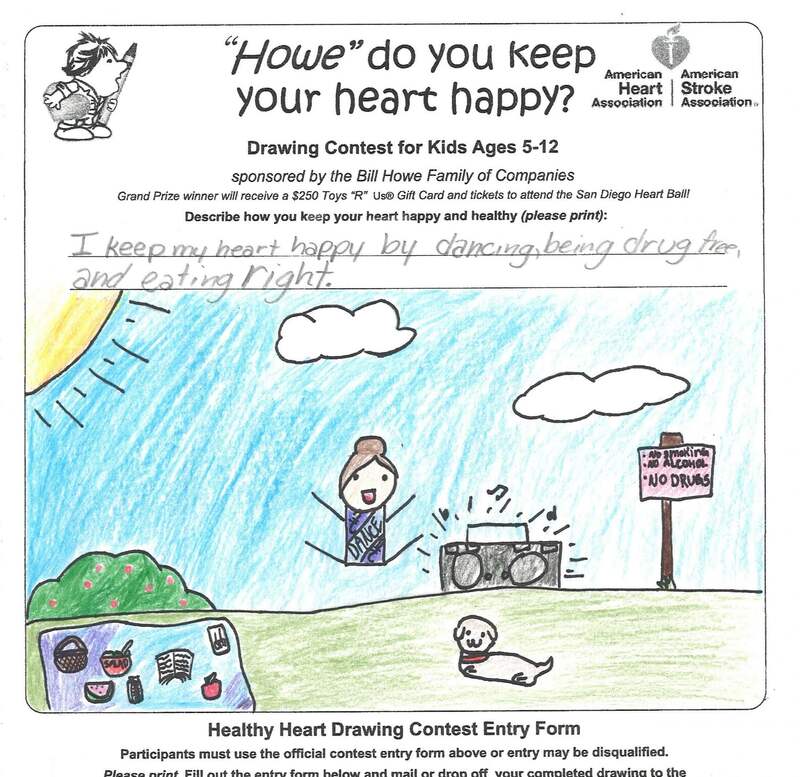 We are so pleased to help raise awareness of stroke and heart disease and help the AHA in reducing these “silent” killers in the San Diego community, while encouraging active and healthy lifestyles. Ideas might include exercise, healthy eating, and more. Encourage your child to have fun and be creative! What are the rules? One entry per child. Submissions are closed for 2017. 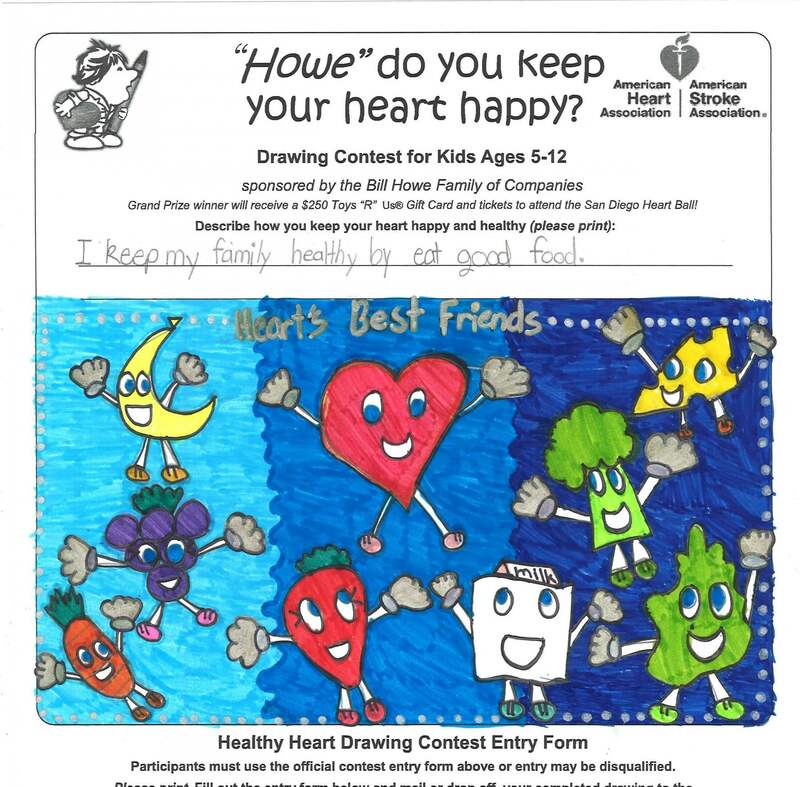 Every family that enters will receive a free “Heart Health @ Home” guide by mail. The winner of the contest will be announced on April 24, 2017, and will be invited to participate in post-contest promotions. On April 10, 2017 entries will be narrowed down to 100 finalists. 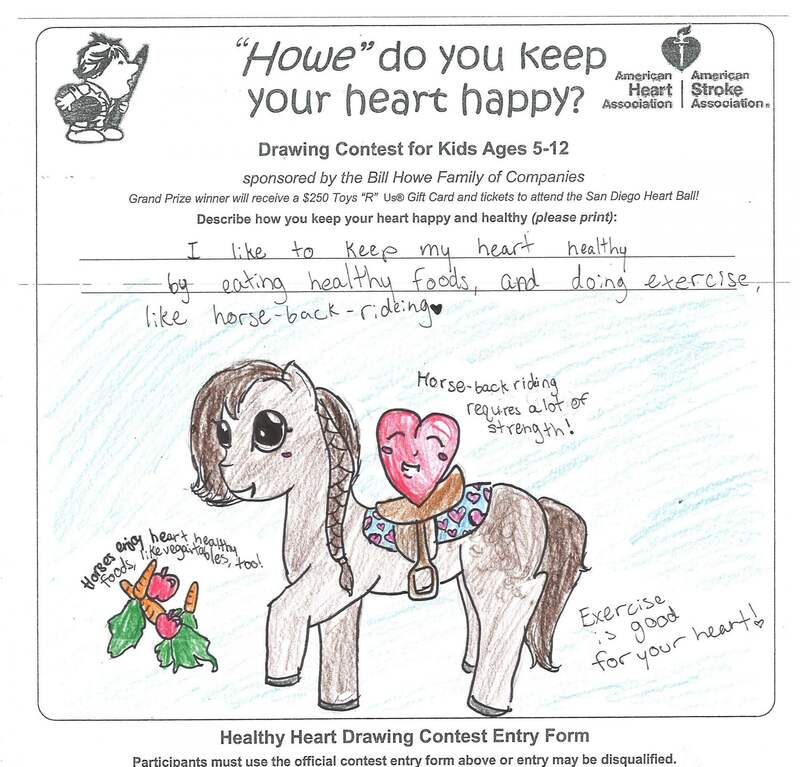 Finalist’ drawings will be posted on Facebook and opened to public vote in which the drawing with the most “likes” and “comments” will win a $100 Toys “R” Us® gift card (additional rules apply to the Facebook vote). The winner of the contest’s school will receive $1,000 from Bill Howe Family of Companies for use in Art and/or Physical Education department(s). The winner of the contest will receive a $250 Toys ”R” Us® gift card. Four runners-up will be chosen in the following age group; 5-6, 7-8, 9-10, 11-12. Runners-up in each age group will each win a $100 Toys “R” Us gift card and the Facebook winner will win a $100 Toys “R” Us gift card. Email Bill Howe Marketing Director, Julie Riddle at [email protected] or call 619-286-6348, or call the American Heart Association at (858) 410-3848. Download the official contest drawing entry form and get started! 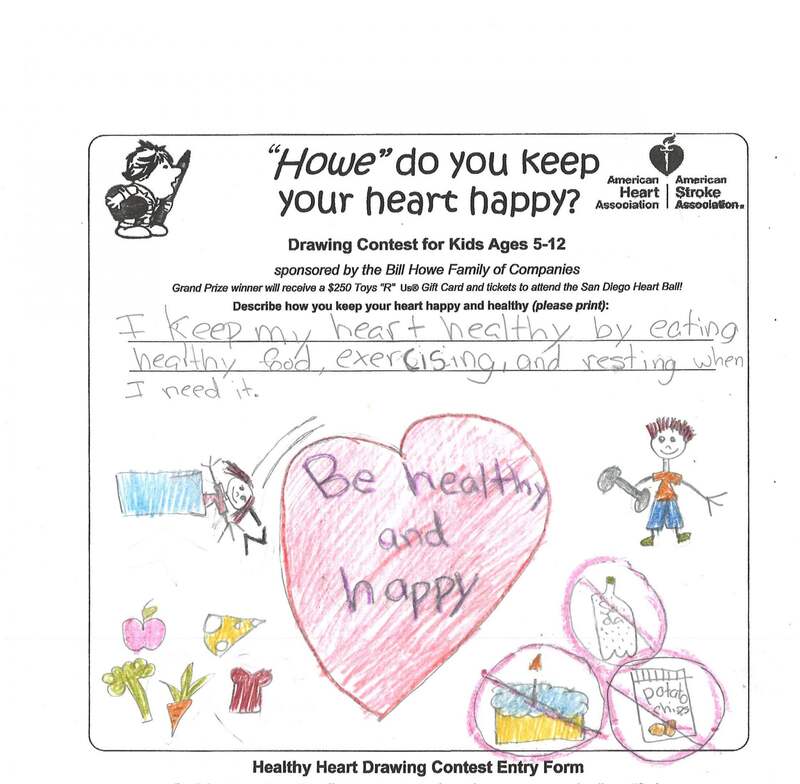 Congratulations to the winners of the “Howe” Healthy is Your Heart Drawing Contest!! We’ve had SO many incredibly talented artists enter this year’s contest that it was VERY hard for our judges to pick the winners. On behalf of all of us at Bill Howe Plumbing, Heating & Air, Restoration & Flood Services and the American Heart Association, we’d like to say a big THANK YOU to everyone who participated in our contest! Remember…Healthy Hearts and Healthy Pipes Make Happy Homes!